Vienna Regulator in polished Black and with Westminster chime. Meticulously crafted, elegant floor clock in hand polished black finish with fine chrome steel accents in the pediment and base. All bevelled crystal glass. Unique, silver plated multifunctional dial with etched rhombic decorations, applied diamond turned chapter rings, second indication, day of the month, day of the week, month calendar, moon phase feature, blued steel hands and easy adjustment of all functions. Chrome plated compensation grid pendulum with precision adjustment. RS 001-MK - 116cm Westminster Movement. RS 001-MK polished 4/4 cable movement with Westminster chime on 8-rod gong. The movement features automatic beat adjustment and a maintaining power mechanism to provide secondary power while the clock is being rewound. 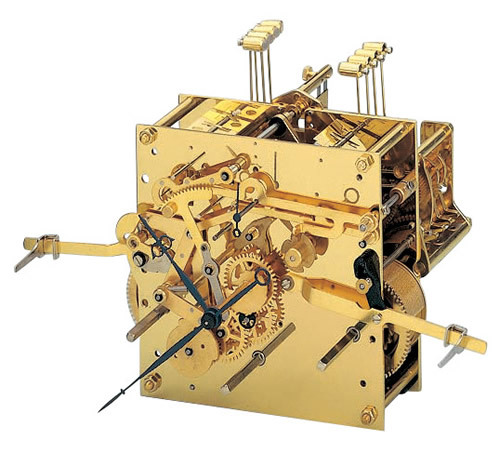 The movement has three drive weights - these provide power to the Strike, Pendulum and Chimes. There are two control levers - the lever on the left provides the selection of Silent, Automatic Night Silencing between 22:00 and 07:15 or Continuous Striking. The lever on the right controls the Westminster chimes. Being a 116cm movement the clock ticks true seconds. Click here to view the Kieninger 0137-96-01 Options and Prices page.